Definition at line 24 of file RISCVAsmBackend.h. Definition at line 33 of file RISCVAsmBackend.h. References llvm::RISCVABI::computeTargetABI(), llvm::MCTargetOptions::getABIName(), llvm::MCSubtargetInfo::getFeatureBits(), llvm::MCSubtargetInfo::getTargetTriple(), and llvm::RISCVFeatures::validate(). Definition at line 41 of file RISCVAsmBackend.h. Apply the Value for given Fixup into the provided data fragment, at the offset specified by the fixup and following the fixup kind as appropriate. Errors (such as an out of range fixup value) should be reported via Ctx. The STI is present only for fragments of type MCRelaxableFragment and MCDataFragment with hasInstructions() == true. Definition at line 274 of file RISCVAsmBackend.cpp. References adjustFixupValue(), llvm::alignTo(), assert(), llvm::MCAssembler::getContext(), getFixupKindInfo(), llvm::MCFixup::getKind(), llvm::MCFixup::getOffset(), Info, llvm::ArrayRef< T >::size(), llvm::MCFixupKindInfo::TargetOffset, and llvm::MCFixupKindInfo::TargetSize. Definition at line 353 of file RISCVAsmBackend.cpp. Definition at line 79 of file RISCVAsmBackend.h. Target specific predicate for whether a given fixup requires the associated instruction to be relaxed. Definition at line 68 of file RISCVAsmBackend.cpp. References llvm::RISCV::fixup_riscv_rvc_branch, llvm::RISCV::fixup_riscv_rvc_jump, and llvm::MCFixup::getKind(). Definition at line 95 of file RISCVAsmBackend.h. References llvm::array_lengthof(), assert(), llvm::FirstTargetFixupKind, llvm::MCFixupKindInfo::FKF_IsPCRel, llvm::MCAsmBackend::getFixupKindInfo(), getNumFixupKinds(), getRelaxedOpcode(), mayNeedRelaxation(), llvm::RISCV::NumTargetFixupKinds, relaxInstruction(), and writeNopData(). Definition at line 91 of file RISCVAsmBackend.h. Definition at line 134 of file RISCVAsmBackend.cpp. Referenced by getFixupKindInfo(), and mayNeedRelaxation(). Definition at line 143 of file RISCVAsmBackend.h. Definition at line 142 of file RISCVAsmBackend.h. Inst - The instruction to test. STI - The MCSubtargetInfo in effect when the instruction was encoded. Definition at line 148 of file RISCVAsmBackend.cpp. Inst The instruction to relax, which may be the same as the output. STI the subtarget information for the associated instruction. [out] Res On return, the relaxed instruction. Definition at line 96 of file RISCVAsmBackend.cpp. References llvm::MCInst::addOperand(), llvm::MCOperand::createReg(), llvm::MCInst::getOpcode(), llvm::MCInst::getOperand(), llvm_unreachable, and llvm::MCInst::setOpcode(). Check whether the given target requires emitting differences of two symbols as a set of relocations. Definition at line 55 of file RISCVAsmBackend.h. References applyFixup(), llvm::HexStyle::Asm, createObjectTargetWriter(), llvm::Data, Fixup, shouldForceRelocation(), shouldInsertExtraNopBytesForCodeAlign(), shouldInsertFixupForCodeAlign(), Size, and willForceRelocations(). Definition at line 43 of file RISCVAsmBackend.h. Definition at line 28 of file RISCVAsmBackend.cpp. 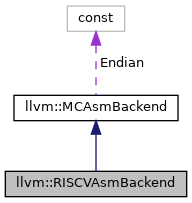 References llvm::MCExpr::findAssociatedFragment(), llvm::RISCV::fixup_riscv_got_hi20, llvm::RISCV::fixup_riscv_pcrel_hi20, llvm::RISCV::fixup_riscv_pcrel_lo12_i, llvm::RISCV::fixup_riscv_pcrel_lo12_s, llvm::MCAssembler::getContext(), llvm::MCSubtargetInfo::getFeatureBits(), llvm::MCFixup::getKind(), llvm::MCFixup::getLoc(), llvm::MCFixup::getValue(), llvm_unreachable, and llvm::MCContext::reportError(). For some targets this may be necessary in order to support linker relaxation. The number of bytes to insert are returned in Size. Definition at line 305 of file RISCVAsmBackend.cpp. Referenced by requiresDiffExpressionRelocations(), and shouldInsertFixupForCodeAlign(). Hook which indicates if the target requires a fixup to be generated when handling an align directive in an executable section. Definition at line 323 of file RISCVAsmBackend.cpp. References llvm::MCFixup::create(), llvm::MCConstantExpr::create(), llvm::NVPTXISD::Dummy, Fixup, llvm::RISCV::fixup_riscv_align, llvm::MCValue::get(), llvm::MCAssembler::getContext(), llvm::MCSubtargetInfo::getFeatureBits(), llvm::MCAssembler::getWriter(), llvm::MCObjectWriter::recordRelocation(), and shouldInsertExtraNopBytesForCodeAlign(). Definition at line 48 of file RISCVAsmBackend.h. If the target cannot generate such a sequence, it should return an error. Definition at line 153 of file RISCVAsmBackend.cpp.